The whole house water filter system (or point-of-entry-filter) is the most convenient of all the water filter systems because it is installed directly into the main water line. Thus, it filters all the water in the house, including laundry room, bathrooms, and kitchen. If you are primarily interested in a whole house water softener system without whole house filtration, go directly to our Water Softener Reviews. There are also a number of whole house water filter systems on the market that basically only filter for rust and sediment. Most of these systems are in the $200 to $500 price range. I don’t see any point in buying a whole house system that only filters for sediment and rust because you would still need a drinking water filter and a shower filter. For drinking water, a much higher level of filtration is needed to remove dangerous tap water contaminants. An additional shower filter would be needed (for optimal health) to remove chlorine. Thus, I highly recommend whole house water filters that will not only filter rust and sediment, but will also filter enough contaminants to provide water that is healthy for drinking, cooking, and showering. Even though reverse osmosis whole house filter systems are popular, I do NOT recommend them for a number of reasons, including the health disadvantages of drinking de-mineralized water for more than a few days or weeks. You can read more on the advantages and disadvantages of drinking reverse osmosis water here. The higher quality whole house systems use multiple stages of filtration to remove 30 plus dangerous water contaminants. Many brands do not filter nearly as many contaminants from tap water as do the drinking water filters (such as the countertop and under sink filters). The whole house systems I am recommending are based on their quality filtration media, product certifications, customer reviews, overall value, and the fact that they do not remove minerals. Using a high degree of filtration, these systems do provide water that is suitable for all household uses, including drinking and showering. Thus, they are exceptional in the whole house water filter market. 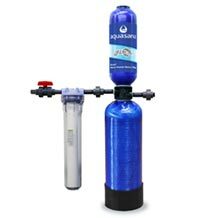 Aquasana’s whole-house water filter systems can be customized for your source water (either city water or well water). What I like best about the Aquasana system is that they are NSF certified to reduce 97 percent of the chlorine from your water for less than 50 cents a day! By reducing most of the chlorine from the point where it enters your home, risky disinfection by-products (DBPs) and volatile organic chemicals (VOCs) are significantly reduced or eliminated. Since these systems use selective filtration (removing chlorine and other contaminants without removing minerals), the enhanced pH balance of the water may improve the texture of your skin and hair. I also like the fact that these systems require no electricity and no manual back flushing. In addition, they are easy to maintain. NOTE: Any of these systems can be upgraded to include a Sterilite UV filter for total protection against bacteria and viruses. OR you can add on a salt-free water softener if you have hard water. These systems are best installed by a plumber unless you are handy with tools and household plumbing and can do it yourself. 600,000 Gallon Rhino® Whole House System comes with a 90-day satisfaction guarantee and a 6-year warranty on the tanks. The filter for the EQ-600 Rhino whole house system lasts for 600,000 gallons (about 6 years on average). A great value for the price. 500,000 Gallon Well Water Rhino® Whole House System has a 90-day satisfaction guarantee and a 5-year warranty. The multi-stage filtration system includes the Sterilite UV filter to protect your water supply from bacteria and viruses. Note about Hard Water: If you have very hard water, check out Aquasana's combo Rhino whole house filter + salt-free water softener systems for both city and well water. Pelican’s whole house water systems are virtually maintenance-free, high-capacity systems. They have a 600,000 to 1,000,000-gallon capacity. Top rated valves and tanks are used in manufacturing each system and are backed by a limited lifetime parts warranty. Pelican uses a blend of high-grade coconut shell based activated carbons in the premium whole house systems. These media are designed to filter chlorine, chloramines, pesticides, herbicides, pharmaceuticals, industrial solvents and hundreds of other contaminants that may be present in your water. The systems also include a KDF 55 media, and a bacterial static media to inhibit bacterial growth. These systems are NSF/ANSI 42 and WQA/NSF 61 certified. The large diameter of the filtration tank holds a significant amount of water filtration carbon media to increase overall filtration performance and lifespan. The systems do not waste water, require no electricity and are easy to install (inside or outside). One of the values of the Pelican systems is that the replacement cost of filtration media is less than many of the other brands. When it is time to replace the filter, you simply replace the media inside the tank, which requires no plumbing or replacement of the entire tank. Both the 600,000 whole house system (for 1-3 bathrooms) and the 1,000,000 system (for 4-6 bathrooms) come with a 90-day satisfaction guarantee, a 5-year performance guarantee, and a limited lifetime warranty on tank and parts. The well water whole house systems are essentially the same as the premium whole house system with a UV filtration add-on to protect against bacteria and viruses. Crystal Quest offers several whole house systems under three main categories: compact, mid-size, and full-size. They range in price from about $200 to $3,600. The CQ whole house systems I recommend are the Eagle 1,000 and Eagle 2,000 whole house water filter plus alkalizer. The main difference between these two models is that the Eagle 1,000 has 11 stages of filtration and the Eagle 2,000 has 14 stages. With 11 to 14 stages of filtration, these systems remove hundreds of contaminants, including sediment and rust, microbials and cysts (giardia, cryptosporidium), 99 percent of chlorine, as well as trihalomethanes (THMs) herbicides, insecticides, pesticides, volatile organic compounds (VOCs), PCBs, MTBEs and hundreds of other chemical contaminants. They also remove heavy metals such as mercury, lead, and copper. In addition, you have the add-on option for filtering specific known contaminants in your water such as arsenic or fluoride. The pricing also varies depending on whether you get a fiberglass or stainless steel casing. The stainless steel is obviously going to be more durable. Filter changes are easy and they have a capacity of 350,000 gallons (3+ years). Professional installation is recommended. These systems are easy to maintain, have a 30-day money-back guarantee and a 1-year warranty. Note about Hard Water: If you have very hard water, check out Crystal Quest's combo whole house filter + salt-free water softener systems for both city and well water.